Mastering these riffs will get your chops razor sharp and stronger than ever. The title of this month’s Metal for Life column is a reference to the title of one of my favorite tracks from Cacophony’s 1987 debut release, Speed Metal Symphony. Similar to the playing of guitar greats Jason Becker and Marty Friedman on that trailblazing album, the riffs I present this month are challenging in that they are meant to be played fast while also covering a lot of fretboard territory. Mastering these riffs will get your chops razor sharp and stronger than ever. In terms of harmony, FIGURE 1 is not based on any particular scale or intervallic structure. It’s built from a steady, insistent open low-E pedal tone played in straight 16th notes. I begin by picking F# at the second fret with a downstroke, then pulling off to the open low E string. After playing two low E notes, I use an upstroke to sound an F note at the first fret, which is followed by another pull-off to the open string. A similar figure is played in bar 2. Across bars 3 and 4, I use alternate picking to perform challenging 16th-note-based phrases with string skips. A wide fret-hand stretch is required here. At the beginning of bar 3, I fret A (sixth string, fifth fret) with my middle finger and then use my index finger and pinkie to fret consecutive notes on the fourth string. To perform these lines properly, keep your pick hand as loose as possible at all times. Also, through the use of light palm muting (P.M.), I block every string from sounding except the one that is struck as the riff progresses. In FIGURE 2, I expand on the string-skipping technique to play a series of repeating one-bar riffs in 5/4 meter. Again, light palm muting is used throughout to provide a percussive sound as well as add an element of precision to the sound of each note. This example is also a great workout for developing independence between the fret-hand ring finger and pinkie, which is always a very important thing to focus on. 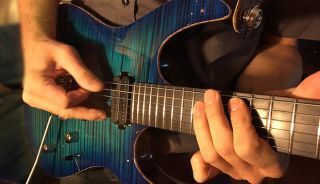 A twist here is that I do not use steady alternate picking throughout: after the initial downstroke, I pick four consecutive upstrokes, followed primarily by alternate picking for the rest of the lick. No matter the pick direction, attention is paid to economy of movement and precise pick placement. FIGURE 3 is another great drill for building up independence between the fret hand’s ring finger and pinkie. The phrases in bars 1–5 are constructed from two-note patterns wherein the first note is picked, followed by a pull-off. In bars 6 and 8, I alternately hammer-on from the index to the middle, the ring, or the pinkie in ascending and descending patterns.